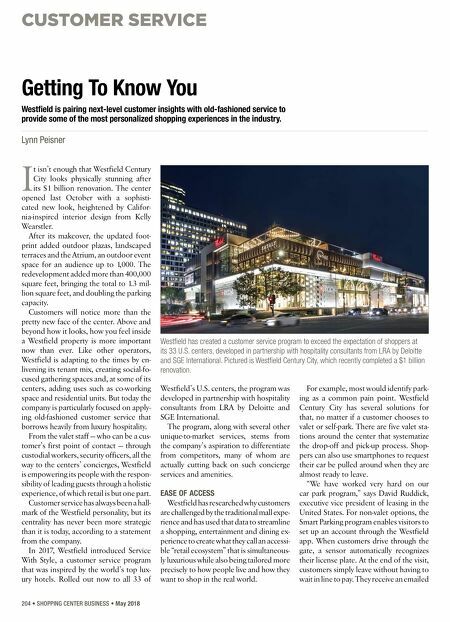 CUSTOMER SERVICE 204 • SHOPPING CENTER BUSINESS • May 2018 I t isn't enough that Westfield Century City looks physically stunning after its $1 billion renovation. The center opened last October with a sophisti- cated new look, heightened by Califor- nia-inspired interior design from Kelly Wearstler. After its makeover, the updated foot- print added outdoor plazas, landscaped terraces and the Atrium, an outdoor event space for an audience up to 1,000. The redevelopment added more than 400,000 square feet, bringing the total to 1.3 mil- lion square feet, and doubling the parking capacity. Customers will notice more than the pretty new face of the center. Above and beyond how it looks, how you feel inside a Westfield property is more important now than ever. Like other operators, Westfield is adapting to the times by en- livening its tenant mix, creating social-fo- cused gathering spaces and, at some of its centers, adding uses such as co-working space and residential units. But today the company is particularly focused on apply- ing old-fashioned customer service that borrows heavily from luxury hospitality. From the valet staff — who can be a cus- tomer's first point of contact — through custodial workers, security officers, all the way to the centers' concierges, Westfield is empowering its people with the respon- sibility of leading guests through a holistic experience, of which retail is but one part. Customer service has always been a hall- mark of the Westfield personality, but its centrality has never been more strategic than it is today, according to a statement from the company. In 2017, Westfield introduced Service With Style, a customer service program that was inspired by the world's top lux- ury hotels. 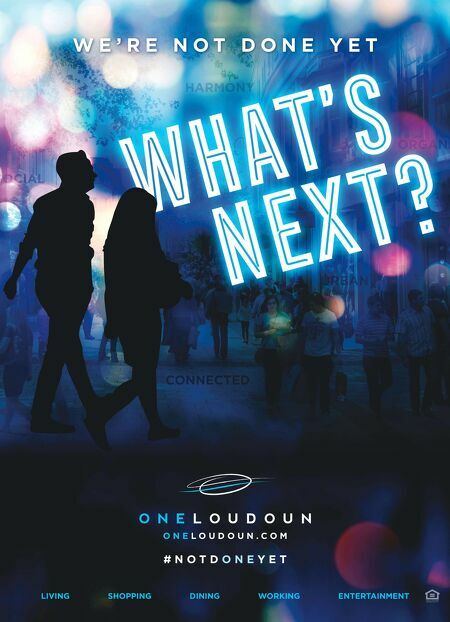 Rolled out now to all 33 of Westfield's U.S. centers, the program was developed in partnership with hospitality consultants from LRA by Deloitte and SGE International. The program, along with several other unique-to-market services, stems from the company's aspiration to differentiate from competitors, many of whom are actually cutting back on such concierge services and amenities. EASE OF ACCESS Westfield has researched why customers are challenged by the traditional mall expe- rience and has used that data to streamline a shopping, entertainment and dining ex- perience to create what they call an accessi- ble "retail ecosystem" that is simultaneous- ly luxurious while also being tailored more precisely to how people live and how they want to shop in the real world. For example, most would identify park- ing as a common pain point. Westfield Century City has several solutions for that, no matter if a customer chooses to valet or self-park. There are five valet sta- tions around the center that systematize the drop-off and pick-up process. Shop- pers can also use smartphones to request their car be pulled around when they are almost ready to leave. "We have worked very hard on our car park program," says David Ruddick, executive vice president of leasing in the United States. For non-valet options, the Smart Parking program enables visitors to set up an account through the Westfield app. When customers drive through the gate, a sensor automatically recognizes their license plate. At the end of the visit, customers simply leave without having to wait in line to pay. They receive an emailed Getting To Know You Westfield is pairing next-level customer insights with old-fashioned service to provide some of the most personalized shopping experiences in the industry. Lynn Peisner Westfield has created a customer service program to exceed the expectation of shoppers at its 33 U.S. centers, developed in partnership with hospitality consultants from LRA by Deloitte and SGE International. Pictured is Westfield Century City, which recently completed a $1 billion renovation.